Rapeseed oil is our frequent companion in the kitchen – we use it for frying, sprinkle it with spring salads, pickle herring in it, also works great as an accompaniment to bread! Its taste and universal application is not the end of its advantages. Get to know more! Rapeseed oil contains ALA acid, which affects the development of nerve cells and the brain. Rapeseed oil contains a lot of essential unsaturated fatty acids from the omega-3 (alpha-linolenic acid) and omega-6 (linoleic acid) families. These fats are not produced in the human body, therefore they must be supplied with food products. They are essential for the body – they help maintain normal blood cholesterol levels and are essential for the proper development and functioning of the body. 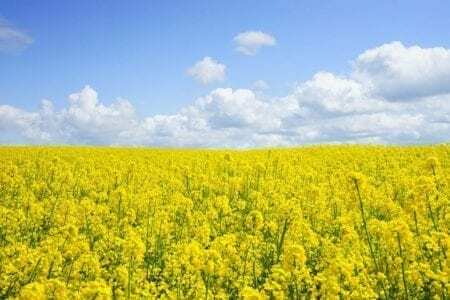 Rapeseed oil also contains other beneficial ingredients for health, such as vitamin E, which helps protect cells against oxidative stress, as well as sterols, which lower blood cholesterol levels by partially inhibiting its absorption in the intestines. Vitamin E has a very strong antioxidant effect, protecting unsaturated fatty acids against the harmful effects of oxygen. 5. It is a component of many cosmetics! It works perfectly as massage oil, peeling ingredient, eye serum, and face masks. Rapeseed oil is a source of unsaturated fatty acids (including oleic acid) and the aforementioned vitamin E, which naturally prevents the formation of wrinkles and aging.